Plastic is fast replacing glass as the chosen material in many laboratories, as plastic beakers are more durable and affordable. 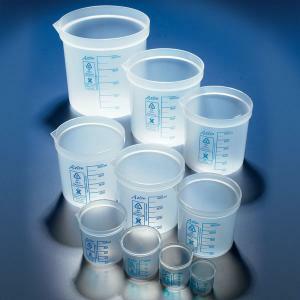 In this glass-to-plastic changeover, you want to be sure you are choosing plastic beakers that are compatible with lab usage. 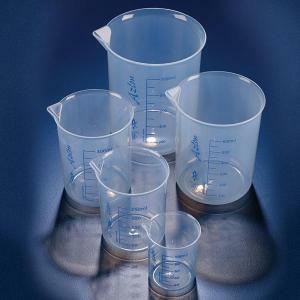 Next Day Science offers the highest quality plastic beakers. 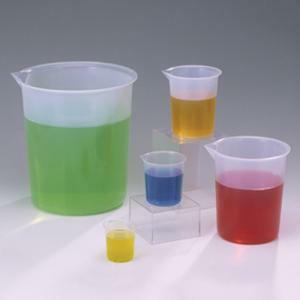 The One-Spout Pour polypropylene beakers feature raised, permanent numeric graduations to show the contained volume (±5%), and are transparent, chemical resistant, and stackable. They have no-drip spouts for easy pouring, and are steam autoclavable to 121°C (250°F). 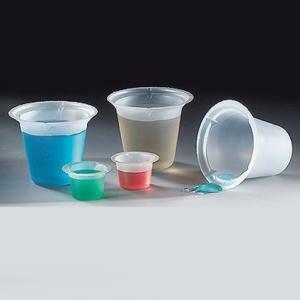 The Polypropylene Tri-Corner Plastic Beaker, Economy-style plastic beakers feature three dripless pouring spouts and graduations in mL and/or ounces. 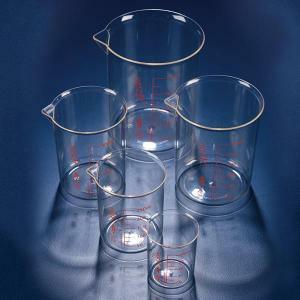 Beakers are available in several sizes and quantities. 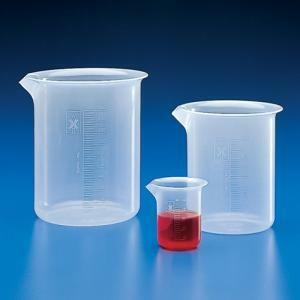 A beaker is a piece of laboratory equipment that is used to store mostly liquids. They are usually cylindrical and have a flat bottom. Most of them have a little spout (or ‘beak’) to allow for efficient pouring. They are available in many sizes, from as tiny as just 1 milliliter up to several liters. Beakers often have graduations on the side to show the volume of the substance contained therein. 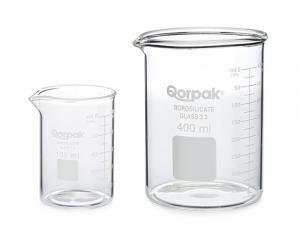 For example, a 500ml beaker might have the following markings on it: 50, 100, 150, 200, 250ml, and so on. These volumes are only an estimation, in fact. 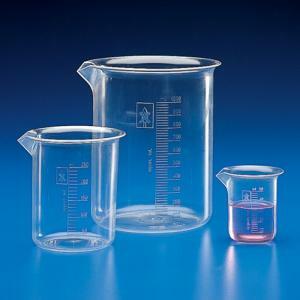 A more appropriate item to use for measuring volume precisely would be a volumetric flask or a graduated cylinder. However, a beaker is accurate to within around 10%. What are beakers made from? Traditionally, beakers have been made from glass for many years. These days, however, beakers come in a variety of materials. 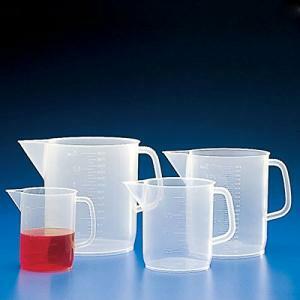 Beakers are made from Pyrex, a different type of glass from the usual, plastic, paper and even platinum. Increasingly, plastics are taking over from other materials because of their ease of use and affordability. Many new plastics have been developed that are suitable for very specific kinds of substances and chemical reactions. Plastic is flexible and moldable, making it a great choice for many applications. With the right choice of plastic, you can cater for almost all your beaker needs. How do you use a plastic beaker? 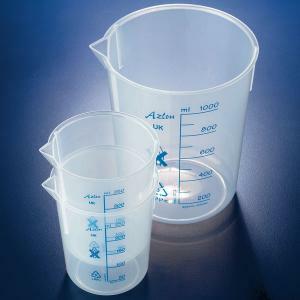 You use a plastic beaker in just the same way as you use a glass beaker: to store samples, liquids, and other substances, and to measure volumes. 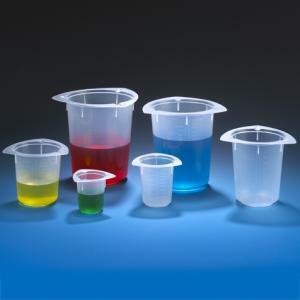 The difference is that the plastic from which the beaker is made dictates what kinds of chemical reactions and temperatures the product can withstand. In fact, one type of plastic is so robust that it can contain hydrofluoric acid, which cannot be stored in glass because it eats through it. 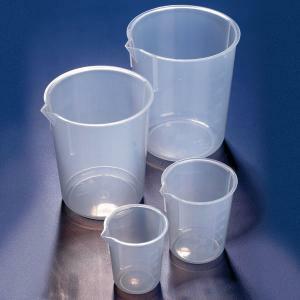 How do I store samples in a plastic beaker? Because beakers have a spout, they cannot have a lid. 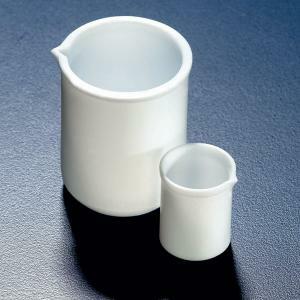 To cover a beaker when in use, you can cover the beaker with a larger, inverted beaker. The other way of doing it is to cover the beaker with a watch glass. This prevents contamination and loss of the contents of the beaker but also allows for venting via the spout.